I’ll be honest, I’m not really that into sci-fi, I have always preferred Superheroes and fantasy to spaceships and lasers. There have been exceptions to this rule of course, Ridley Scott’s Alien, John Carpenter’s The Thing, Paul Anderson’s Event Horizon, and now Agent 1.22 has joined that illustrious list. Cyborg operative Agent 1.22 is an emissary of T.E.R.R.A (Technologically Advanced Regimented Reconnaissance Agent) cryogenically preserved in deep sleep between assignments. When external communication is lost with Fortress DX-B Biotech Facility, Agent 1.22‘s Mother-Ship – S.S.MNEMOSYNE proceeds to the third moon of Pandora-5 to discover the fate of the facility and its staff. Biotech Facility DX-B has recently been host to a team of scientists working on developing a vaccine for the insidious Tempest Virus that has been devastating the outer colonies. The last transmission received from the facility was 91 days previous and the data indicated that the mission was close to success. With the facility in lockdown and communications unresponsive, Agent 1.22 must infiltrate the biotech labs and ascertain what has happened. Visually beautiful, this first issue has an almost movie like ambience that propels the reader into the storyline, creating a compelling atmosphere. The story hits all the right notes; suspense, intrigue, action and even though our hero is a silent protagonist, we find ourselves becoming emotionally attached to her through the monologues of her A.I. space cruiser Mnemosyne, which is not only her conveyance through space but also a surrogate mother, who is slowly assimilating the concept of human parenting in order to keep Agent 1.22 safe and fully prepared for any danger or unexpected outcome. When two of Agent 1.22‘s creators, Angelo Panetta and Tom Dheere contacted me recently and asked if I would be interested in not only reviewing Issue #0 pre-release but also exclusively writing a synopsis for their website and Kindle profile, I absolutely jumped at the chance. I had been following the project for quite sometime at that point, and was intrigued initially by the awesome art-style and then drawn in by the slowly revealing story arc. As I mentioned at the start of this piece, I am not really much of a fan of Sci-Fi overall, but I am a fan of great fiction and this is exactly that… a visually resplendent, deep and captivating space thriller, replete with an absorbing mythos and engaging characters. Precinct1313 Rating: 5 Cryogenically Conceived Cyborgs Out Of 5. 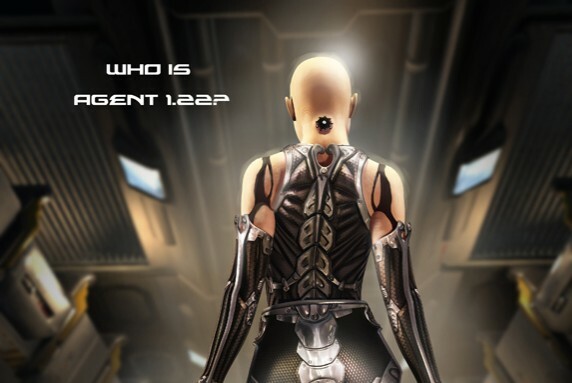 Agent 1.22 was created by: Angelo Panetta, Tom Dheere and David Martin. Written by: Stephan Nilson and Drew Garber. Art by: Douglas Shuler. Agent 1.22 and the above images are copyright: DPM Publishing. Posted on November 17, 2015, in Comics and tagged Agent 1.22, Angelo Panetta, David Martin, Douglas Shuler, DPM Publishing, Drew Garber, Stephan Nilson, Tom Dheere. Bookmark the permalink. 10 Comments. Wow – that is a illustrious list. Thanks, it is indeed, all fantastic movies. Thanks for reading and commenting my friend. Light yrs away from Wonder Woman! No comics yet, altho have got Stronty Dog S/D Agency Files Vol 3 to keep me going. Still another 2 months left for happy searching! Many thanks for th offer, amigo! Was born in Devon(!) but haven’t been back there for ages – if/when I’m in that neck o th woods I’ll let u know! Cool sir, I am not from Devon originally but moved here a number of years back, lovely part of the country. Have a great evening my friend. In a forthcoming Post will outline th comics and books I’m hunting for! Am trying to produce some thrill-power again this evening so hopefully th results shld b great. And u – have a good 1! Just read your piece on Alan Moore, started a birthday piece on him myself, but have been so busy at work that I haven’t had the chance to finish it. So it will be rather belated. Look forward to hearing about your great comic hunt.